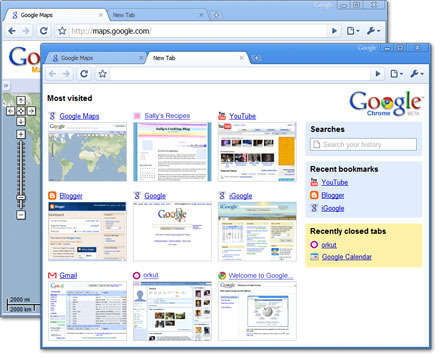 Among the best features for this web browser are speed, security, stability, themes, omnibox, inconigto and new tab. Google Chrome is fast to launch at start up from users desktop and also fast to load web pages that users visit. It also run web application faster than ever, application like Java and HTML based is run faster. If you have several tab running together at one browser, 1 tab crash mean another tabs will survive. So you don’t have to worry about opening too many tabs in one browser. This browser can provide users with better security because it shelter users from malicious websites. If you have how your browser look like or bored to look at the same browser, you can change the themes of your Google Chrome. That mean you can have a browser with a color and look that you prefer, in future there will be tons of themes to choose from. Omnibox will allow us to type in a web address or search the web, all in one box. This entry was posted on Monday, December 14th, 2009 at 12:01 am	and is filed under Interesting Stuff. You can leave a response, or trackback from your own site.